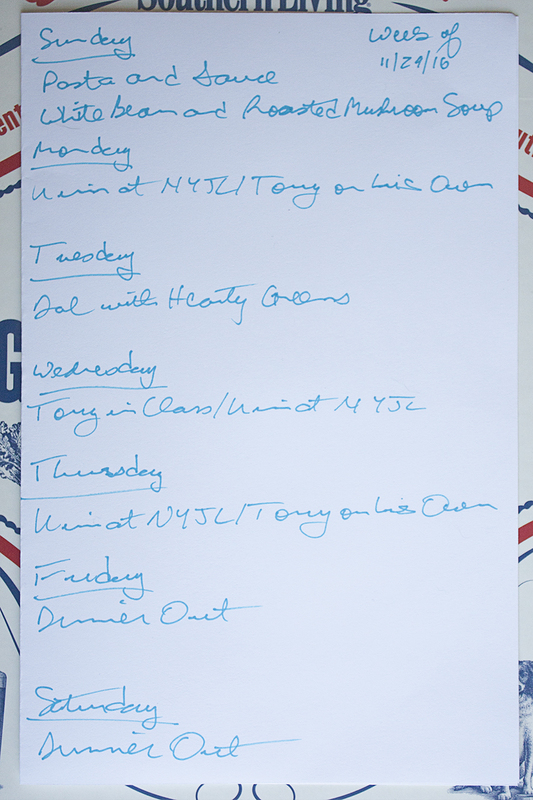 This is going to be a very busy week, with one or both of us having plans five out of seven nights, but we’ll still make time to make two dinners and two new recipes. On Sunday night, we’re going to make pasta and sauce (with meatballs and sausage, plus some spare ribs). No recipe involved; Tony has done it enough times that he can do it in his sleep. The plan is to make enough so that we have leftovers to carry us through the week, either for lunch or dinner. Kim is also making a new recipe that our friend Rachel suggested to us: White Bean and Roasted Mushroom Soup, from the blog She Wears Many Hats. With all the snow in NYC right now and temperatures projected to stay in the 30s all week, it’s good to know we’ll have some soup to keep us warm. Kim will be at the New York Junior League on Monday and again on Thursday, so Tony will be on his own. He’ll probably have the Roasted Pork Tenderloin with Dijon Breadcrumbs and Brussels Sprouts from Delish, which we made last week, on Monday, and some leftover pasta and sauce on Thursday. We’re both out on Wednesday night, so we’re both on our own for dinner. The other new recipe we’ll make this week will be Dal with Hearty Greens. Kim has had had great success making lentils (like the Salmon and Lentils from last week) and Indian food (like the Easy Samosas and Tandoori Shrimp with Rice and Peas we made over the summer), so she thought she would try her hand at a recipe that combines both those elements. We’re attending a bourbon tasting with friends Friday night, so we’ll probably grab dinner out after that, and are seeing a show at Jazz at Lincoln Center on Saturday night, so we’ll have dinner out then too. We’ll be busy this week, but certainly well fed!